If you need any commercial records storage for your business, the professionals at Coastal Moving & Storage can handle the job. We can pack your records for you, or we can pick them up from you pre-packed. First, Pensacola Moving Company will index the records into our sophisticated barcode system, then we’ll bring them back to our facility for safe and secure storage. When you need to access the records again, we can have them retrieved quickly, and usually within one day. We deliver storage cartons to you. Either you can pack your records into the cartons, or we can handle the packing as well. Then, we’ll pick up your cartons and transport them to our secure facility. When you request to have the records retrieved, we’ll get them for you as soon as possible. Most of the time, that will be within less than 24 hours. At Coastal Moving & Storage, we know how important it is that you have timely access to your records when you need them, so we have the workflow in place to make that possible. We have standard operating procedures and a proven barcode system to make records retrieval as efficient as possible and ensure that your records are properly scanned and easily accessible. Facilities – Our safe and secure facilities provide better protection than self-storage. These facilities are designed for and dedicated to managing commercial records. 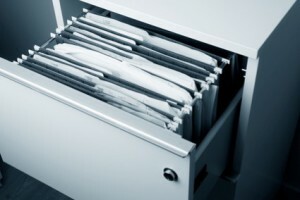 We also have a knowledge of federal records retention guidelines that can provide you with a greater level of protection. Improved Productivity – Using our commercial records storage facility will allow for your records manager to streamline the work that’s required to maintain your records. Your team will benefit from our state-of-the-art records storage facility. Cost – Believe it or not, the cost of an off-site storage for your commercial records is typically only a fraction of what you might pay to store on-site. It’s also around 25-40% less than a self-storage unit, and those options are much less helpful to you and your business. If you are looking for Commercial Record Storage in Pensacola then please call 850-433-8308 or complete our online request form.